"We scheduled our fishing trip for the week of May 18 - 22, 2018. We had never had the pleasure of fishing in Louisiana, but had been told many stories of how great the fishing is in the Burnas - Venice area. We are from South Carolina, about an eleven hour trip from our home. Upon arrival that afternoon we were greeted by a young man named Junior. He was very friendly and made you feel right at home. He showed us where we would be staying. He had already turned on the A/C for us which felt really good because it was pretty warm that day. He showed us where everything was located such as where we would be eating, what time dinner would be served, the cooler where the refreshments were ( beer, water, soft drinks, Gatorade) everything you could imagine. After we unpacked we sat outside under the Tiki Bar where we had a big screen TV to watch, stereo to listen to music and all kinds of snacks to eat. This is the gathering place where every one would talk about how many fish they had caught. Everyone you talked to had caught their limit! We were introduced to Captain Nick, who would be our guide the following morning. Dinner was served and what a meal they had prepared. We had a variety of dishes, fresh grilled fish, salad, shrimp scampi, vegetables, and an apple pie that was out of this world. All the food is made from scratch and it will melt in your mouth. Breakfast is served at 5:00. We had biscuits and gravy, scrambled eggs, grits, hash browns, coffee and juice. It was delicious also. While we are eating the Captain asks what type of beverages you would like for the day. Also they make the most delicious sandwich for your lunch, plus chips and chocolate chips cookies. We left at 5:30 and the fun began. The boat ride to get to the first fishing hole was about 25 minutes. The first cast, fish on. Second cast, same thing. We were catching red fish and trout. Caught our limit of reds went to another spot and caught our limit of trout. Capt Nick never set down. He was constantly baiting your hook, taking off the fish, making sure the boat was in the right position where both of us were able to fish, getting you something to drink. He made sure your were well taken care of. You we treated like royalty. Caught our limit. Go back to camp. The Captain asks how you would like your fish cleaned and packaged. They take care of that while you go get a shower and sit back and have some refreshments. I had the pleasure of meeting Ms Sherri. She helped put our trip together. She was also our cook. Very friendly lady and boy can she cook. Every night she prepared a dish that featured the spicey Louisiana taste. We had Gumbo that was to die for and her homemade desserts were grand. Second day our guide was Capt Roger. We left at 5:30 and was fishing by 6:00. The weather was just beautiful. The water was like glass, but had a nice breeze so you did not feel the heat. Right away, we started catching fish. We were catching reds, trout, black drum, sheep head and some others I can't remember their names. He never sat down either. These captains on the guide boats make sure you have a great time. It is all about the customer. At times I could not cast far enough out, Capt Roger would do that for me. I have never been treated better. If you have the pleasure of having Capt Roger for your guide, ask him about his candied jalapeno peppers. They are a treat also! On our third and final day, Capt Roger was our guide. We left early and were the first to get to this particular fishing spot. He baited our lines and on my first cast, just as soon as it hit the water, the drag started zinging and the action began! I had that monster red I had dreamed about catching. It put up one heck of a fight. It would get close to the boat and it wd take off again. It put up a big fight but I finally got it to the boat and Capt Roger pulled it in. To me it was a monster of a fish. He said between 25 - 35 pounds. Everytime we would throw out, my partner or myself was catching a huge red fish. We fished for about 3 hours. I have never caught so many reds and had to throw them back because they were too big!!!! Finally we both got our limit, but all those big reds we had to throw back in. This was fishing Heaven! We then went to another spot and boom caught our limit of trout. Right in the same area we started catching Black Drum. Caught one that weighed around 35 lbs. I am only mentioning the fish I caught. My partner was catching as many as I was. Again Capt Roger never sat down. I cannot say enough good things about the people and the hospitality we were shown while at Southern Exposure. Sorry for such a long detailed text, but I just wanted people to know what a fantastic place to go fishing. You will be treated like you are the only ones there. You better believe we will be going back. Capt's Nick and Roger, many thanks for such a wonderful experience. To the staff at Southern Exposure, thank you for a trip of a life time." "I just wanted to thank you again for taking such good care of us while we were there. We expected a good time, but all of our expectations were by far surpassed. The food was of course unbelievable. We are convinced that you guys are selling a eating charter, and you throw in some fishing between the meals just to keep us busy. The fishing was amazing, and there is no doubt that we will be back." THANK YOU! Russell Winston 04/22-24/2016. 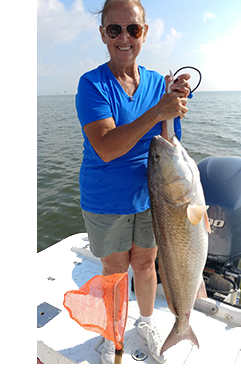 "We had the great pleasure of chartering a fishing trip through Southern Exposure in Buras, Louisiana on 5/16 to 5/17/14. ..... I was so excited about this trip that I cannot help but sit down and write this review for them immediately. It was an absolutely perfect experience. It was evident that these folks luv what they do as we entered the complex....we’d not even made it through the entrance when we were greeted warmly by one of the owners. Once at the lodge, we were given a really warm welcome by Cheri, the wonderful lady who does all the cooking...She pridefully recited the menu for the evening, which after hearing, I could hardly wait to unpack the kids and get to dinner. All of her food is made from scratch and native to the area.....I said I would not eat it all and would watch my weight...... OMG, however, when Cheri presented a appetizers of healthy shrimp dip seasoned with herbs and green on onions on crackers, then a crawfish bread appetizer. I cold not help myself. The conversation amongst the other fishermen and women ensued about fishing and we continued on our appetizers. Then, Cheri, totally....totally.... outdid herself on the main buffet, served in the main dining area of the lodge, ; strawberry and spinach salad, broiled trout, fried trout with homemade tartar sauce, wonderful broiled seasoned potatoes, coleslaw, and a shrimp pasta dish that would beat any contest at Jazz fest for Crawfish Monica. It was exquisite! And, I noted, everyone returned for seconds on that one. Dessert was expert as well with homemade pecan pie.....OMG, best of best, and Bannas Foster. Ok, diet or no diet, I could not resist! I had both. Cheri was an expert with kids too. She had just plain Vanilla Ice Cream, which our 7 and 8 year olds luved. Everyone went to bed that nite with full tummies and expectations of the next day. Thank you Ms. Cheri. "We had a blast! 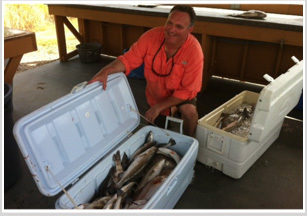 Enjoyed the delicious food, the accommodations are perfect and the fishing was great!" "Southern exposure fishing has by far one of the best places to come and fish! While we were here the weather was a little tough, but that did NOT stop creighton or Mike from putting us on Reds, trout or Drum. We caught alot of fish and had a great time!!! Mrs. Sheri is also one of the best chefs I have ever had the pleasure of meeting - she is a wonderful chef. THE FOOD IS WAY TOO GOOD! I already plan on coming back this year and next. Also, the lodge is one of the Best !!! " "I have fished with many outfittters/ captains but none as hospitable as that was at Southern Exposure. This food was unbelievable and Sheri is one of the most hospitable ladies I have been around." "Great week, awesome food, great fishing! Thank you to the host!" "The food and hospitality was exceptional and the fishing equally awesome! Ms. Sheri and Creighton ensured all had a terrific, fun filled and relaxing time. Bonus ... lots of fish caught by all. Thank you for the memorable time, felt like family." "The experience was incredible. Everything was done to make the trip a memory to treasure. Mrs. Sheri's cooking can't be beat. The lodge and cabins are a great place to relax and interact after a Great day of fishing. Can't wait to come back." Bill Petrus - T.P. Outdoors "Adventures Television Show"
P.S. You ain't going to get better services or food!" "Great trip, caught lots of fish and the food was great. Unbelievable trip! Thank you so much." "Thank you for everything! Sheri, let me tell you, you are one of the best cooks ever." "The best damn fish I ever had and I am a damn good cook myself! Thanks!" 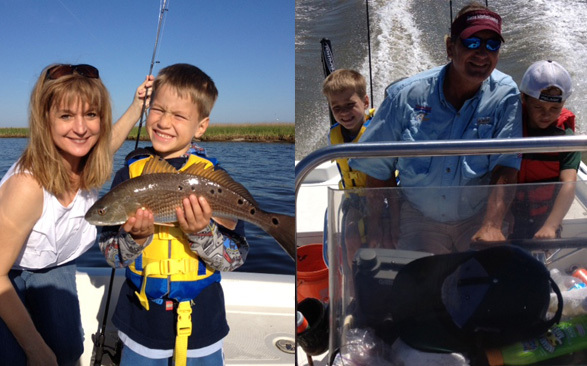 "The fishing was Great but the food - better, enjoy every time we come!" "This is one of the most relaxing adventure trips that I can say I have ever been on. Great Fishing! Amazing Food! Awesome place to come to in Southern LA and stay... Will be back." "19 Speckled trout in 30 minutes. Two of us, can't beat that - call Guiness!" "Awesome day - 67 Trout- best day ever." Austen and I had a fantastic time. The fishing was great, hanging out with ya'll was even better! Sheri - your cooking is off the charts! Unbelievable how hard you work to make everything so good. Creighton - thanks so much for fishing with us. Austen enjoyed it as usual. Tim - thanks for helping with the fish. We'll be back! And hopefully we can request Crab Stew and Gumbo." "Mibiana - Thank You for everything. The food was great. Next time will have to come and stay with you all. Thanks." "Thank you all so very much! We had a great time, feels like home! Great food, Great conversation and most of all - great fishing! This was our first trip but we will certainly come back to see you all again. Thanks for the hospitality!"